Welcome to the Athena Top tutorial! This is designed to work hand in hand with the printed instructions. As I mention in the instructions, Athena is a closely fitting woven top so I highly recommend you make a toile before cutting into your final fabric. This is always a good idea to do anyway, but especially with close fitting garments! Day 1 is about getting your pattern pieces ready, and doing some initial measurements. As with any pattern, start off by tracing your size in a brightly coloured marker to make sure you can distinguish between the lines when cutting. The pattern shown here is not the Athena blouse but the same step applies. Use the finished garment measurements as your guide, rather than the relying on the sizing or body measurements only. - Does the bodice pattern as it is hit at my own natural waist? For the bodice, I find the best way to visualise this is to hold your bodice pattern piece up on yourself in the mirror - ensuring that the shoulder seam is in the correct place at the top of your shoulder. Remember to account for the 1cm seam allowance already included. Are you happy with where the waist seam will be, or does it need to be a bit longer or shorter? ...and paste or tape onto a new piece of paper, making sure that the centre front is on a straight line. Whatever you have adjusted in the front, make sure you apply the exact same adjustment to the bodice back. In the photo above, that means I would also add 2cm in length to the back bodice. Repeat this process for the sleeve, though you may find it easier to use a tape measure and measure from the tip of your shoulder to where you would like the sleeve to end. 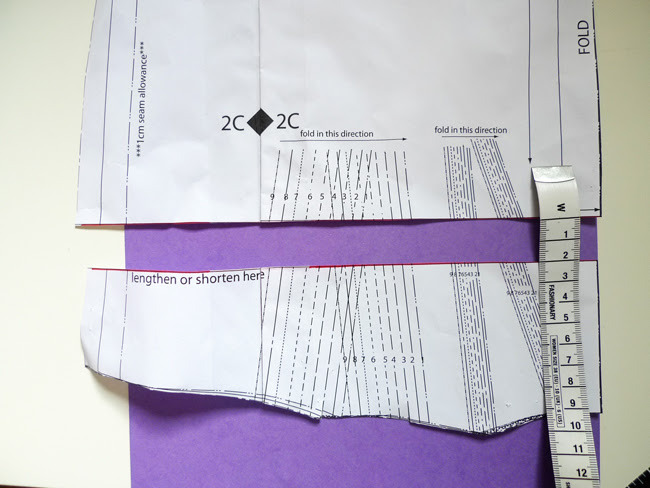 Cut out your pattern and mark all notches and pleat or dart points on the fabric, using chalk or a fabric marker, or snipping at notch points at the seam - but be sure to stay within the 1cm seam allowance. 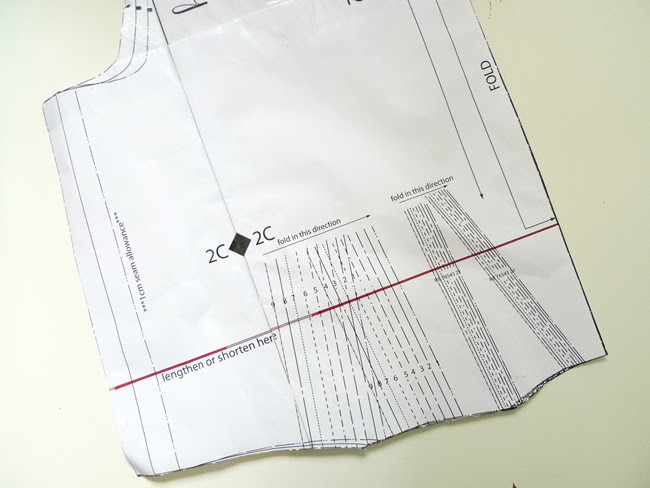 While you have your fabric marker out, it is helpful to draw in the pleats on the wrong side of the bodice front, as shown below. Be very precise! You can do the same for the darts on the bodice back, if desired. That's all for now, next we get to watch the bodice take shape!